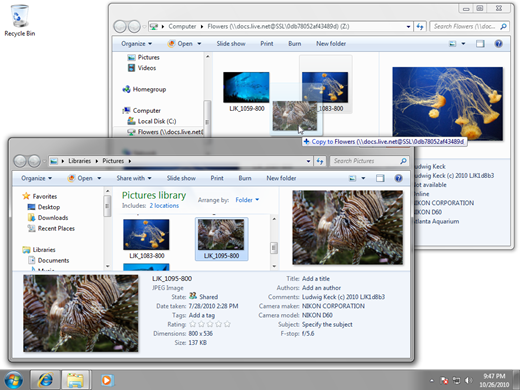 How can I see my SkyDrive photos in Windows Explorer? 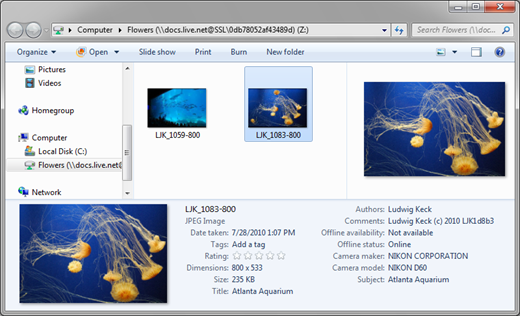 You Windows Live SkyDrive photos are stored “in the cloud” on Microsoft servers. Normally you access them through a browser like Internet Explorer. 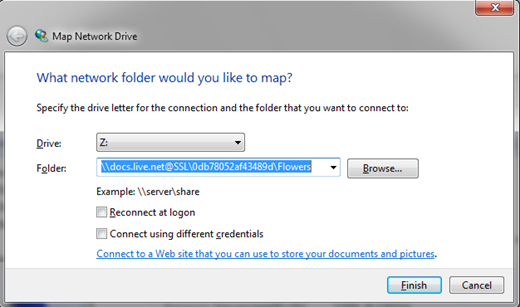 It is possible to map a SkyDrive album to a drive letter in Windows Explorer. Then you can see what photos you have stored in that album. NOTE: This method works in Windows 7. Windows Vista also supports mapping with this procedure, other operating system do not, sorry. Obtain your Windows Live account “cid” number. Once you have that you may want to save it in a file for future use. Sign in to you Windows Live account by going to home.live.com. Click on profile underneath your name in the upper right. Of course, the number will be your own unique number, not mine as shown here. Copy this number for later use. Get the name of the SkyDrive album that you wish to map. Next proceed on your computer. Click Start – Computer. Windows Explorer open showing your drives. On the menu bar click Map network drive. A “Map network drive” dialog opens. Select the drive letter you wish to use. By default the selection is the highest drive letter available, normally Z:. In the Folders box enter this text (without the quotes) “\\docs.live.net@SSL\” ,followed by your cid number, followed by a back-slash, followed by the album name. You will see a “Map Network Drive” dialog. It may take a while for this process to complete. 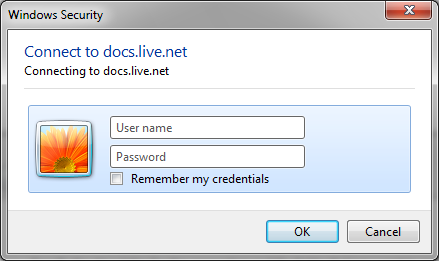 When the “Windows Security” dialog opens enter your Windows Live ID – the complete email address and your password. After another delay a new Windows Explorer window opens showing your SkyDrive album (as illustrated here). You can see thumbnails of your photos and you can see the properties of a selected photo in the properties pane. Can you use this mapped folder like any other? Alas, at the present time (October 2010) when you drag a photo to this folder it seems to work at first. Then you get an error message. The error message may say that the file is too large, regardless of how small it actually may be. Maybe soon Microsoft will enable the functionality that is so close to reality. This entry was posted in SkyDrive and tagged map drive, Photo Gallery, photos, SkyDrive, Windows Explorer, Windows Live by Ludwig. Bookmark the permalink. Unfortunately, mapping a SkyDrive folder is finicky as SkyDrive is undergoing a lot of development. On one machine I had to turn back the firewall to succeed. Use the “send message” feature in the sidebar and tell me your particular setup, I will try and help. Worked brilliantly on my Vista 64. I tried another method from a different source and I could only get to my docs. This takes me to photos. Kudos Ludwig! Back again, I have an HTC HD7 running on Windows Phone 7.5 (Mango). I would like to map the “SkyDrive camera roll” folder but I receive errors. Any suggestions? It’s a standard folder under SkyDrive Photos. Perhaps it’s the folder name that the issue? Will anyone else be able to view my pictures through the site some how or do you always need the email and password? Depending on how you have shared your file or folder there may be a link that anyone can use to see your items. Turn on the info pane at the right and see the Sharing section, it will list who you have shared with. It may say “People with a link” or “People on Facebook” – etc. You can turn off individual share settings at any time: Click the share listing, you will get an option to remove permissions. Open Windows Explorer. You will see OneDrive listed among your Favorites. If you have Windows 8, 8.1, 10 open File Explorer, you will see OneDrive listed below Favorites.